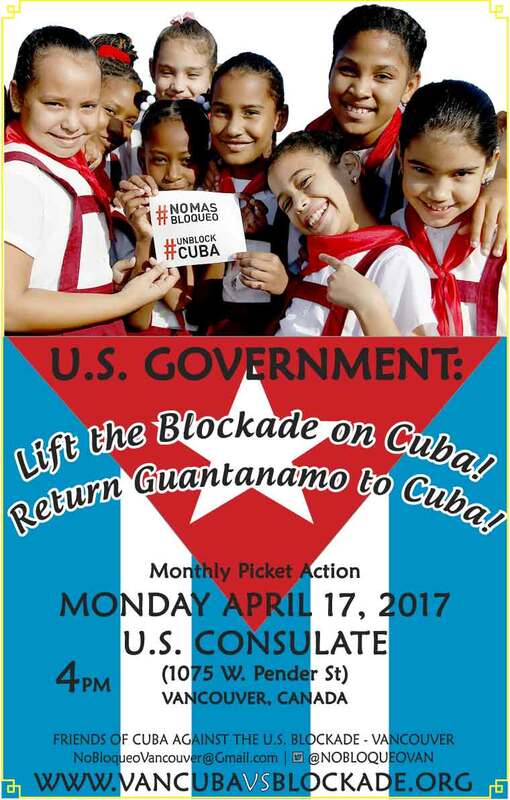 MONTHLY PICKET ACTIONS TO END THE U.S. BLOCKADE ON CUBA! During the latest session of the UN Commission on Population and Development, the Cuban representative, Juan Carlos Alfonso Fraga, highlighted Cuba’s achievements in healthcare and education despite the US blockade on Cuba, which has been in place for more than half a century. This event will be taking place on the traditional and unceded territories of the Tsleil-Waututh, the Musqueam, and the Squamish Coast Salish Nations. Protest at U.S. Embassy: End the illegal U.S. blockade against Cuba, return the occupied territory in Guantanamo and abolish all unjust U.S. laws targeting Cuba! 1150 Commercial Dr. @ William St.
On November 25, 2016 Raúl Castro, the President of Cuba, appeared on Cuban television and announced the passing of Comandante Fidel Castro at the age of 90. The news spread quickly around the world, as did the messages of condolences, in recognition of the incredible impact of his extraordinary life. In the 90 years of his extraordinary life, Comandante Fidel outlasted 10 U.S. presidents (11 counting President Barack Obama). He also survived over 600 assassination attempts orchestrated by the U.S. government and the CIA. Through his unwavering leadership Comandante Fidel Castro steered the Cuban Revolution through 57 years of great gains and great challenges, and through his undying revolutionary internationalism Fidel continued to support the struggles of all oppressed peoples for a just and better world. Who was Comandante Fidel Castro and how will he be remembered? What does Comandante Fidel's passing mean for the future of the Cuban Revolution? What could be the future of U.S.-Cuba relations with incoming U.S. President Donald Trump? How do these changes and others impact the development of Cuba's socialist project?